The first step when you take any trip (being a GAPS-follower or not) is preparation. When you are on the GAPS Diet, this is even more vital. There is no “winging it” as you get away for a quick weekend. Every detail of the trip should be carefully thought out. The more you plan, the more likely you are to enjoy your trip and succeed with maintaining your diet. First, consider your destination. Will you have access to a kitchen (with a fridge) and be able to cook when you arrive? Will you be in a hotel, but still have access to a kitchenette? Or, if you don’t have access to anywhere to cook, do you at least have some form of cold storage? This is the best option (although not always a possibility). The first family vacation that we took (that lasted about 5 days) was to the Upper Peninsula in Michigan, and we were able to rent a condo for a reasonable price that had a full kitchen. It was our home-base for the duration of our trip and having a home-cooked meal that we could all eat every night was wonderful. If you are traveling by automobile, you can pack enough food for the trip, including cold items that you can store in a cooler along with a bag of ice (we usually pick one up at the gas station as we fill up our tank before we get on the highway). If you are traveling by plane, see if it is possible to find a health food store nearby (or at least somewhere where you can purchase ingredients to make GAPS-friendly meals) and buy the groceries that you will need for your stay. I have never tried to bring fermented foods in my carry-on or include them in the ziplock bag reserved for liquids at the airport check-in, but this is a possibility. The only thing I would be concerned about would be leaking from the jar. You could also purchase fermented foods at your location, such as Farmhouse Cultures sauerkraut from Whole Foods. Their kraut is properly prepared, organic and raw (unpasteurized). They have a couple different options as to flavors and would work well until you returned home. 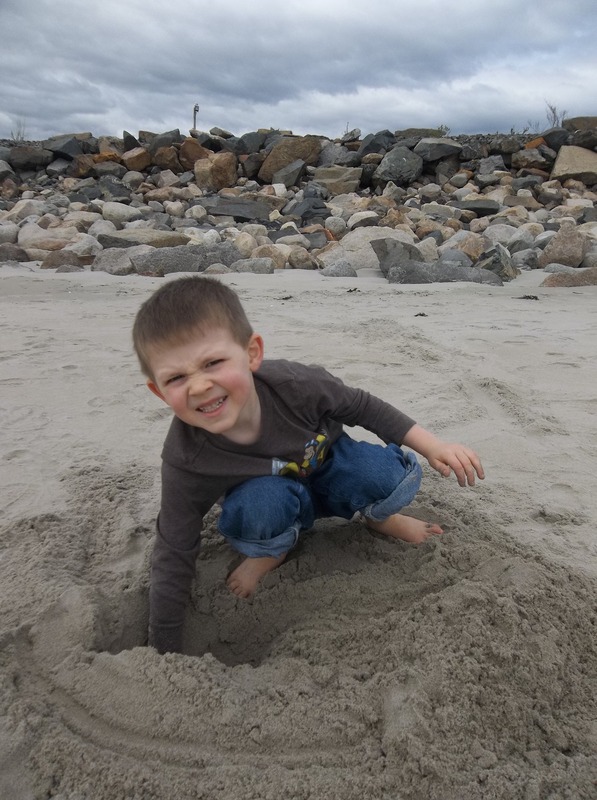 This is the vacation that we experienced last summer when we drove out west and didn’t stay in any state longer than a couple of days. It is also the vacation that we have planned for later this spring (nine days on the road). This is a trickier way of traveling, because you don’t have a home base, you don’t have a kitchen, and after about 3 days of cold meals and snack foods, I’m ready to puke. Make a travel itinerary. I plan where we will be each day, what we will do that day, and what hotel we will be staying in that night. I know exactly what cities we will be traveling through at approximately what time. I usually do this step and the next one simultaneously. Plan to eat. As I’m plotting out our route to our destination, I usually Google organic restaurants or try to find Whole Foods in major cities along the way. I usually end up doing this step before I’ve actually booked reservations at any hotels, because I want to make sure that we end up somewhere near a warm meal. Sometimes, though, if it’s just going to be a long day of travel and we need the straightest shot possible to cut down on hours spent in the car, I will plan to bring cold meals for that day. For us, I try to make sure we don’t go longer than a day or more without a hot meal, though. Whole Foods: When you look in their deli section or buffet area, you can usually find foods that are GAPS-friendly. The best part is that they include labels in their buffet/deli area with a list of ingredients in each product. The last vacation we took, the boys were so excited to be able to eat out at a “restaurant” (you can tell we don’t get out much 😉 ) Also, Whole Foods (or a similar health-food store) is a great place to stock up on more food items and snacks for your trip, so that you don’t need to bring so much with you initially. Hibachi grills: While the food at a hibachi grill and buffet is not organic, you can at least get a hot meal made to your specifications. We avoid the food at the buffet and go right to the grill, where they can prepare a dish of meat and veggies with NO SAUCE (Make sure that you are clear about this! One time we said “no sauce” and ended up with “soy sauce”). I always make sure we take digestive enzymes when eating out to help with any possible cross-contamination. Healthy restaurants: In major cities (and even some smaller ones), it is possible to find restaurants and cafes where they will be serving food from a particular niche, whether it is local, sustainably-grown, organic, free range/pastured, etc. We visited a vegan café once which had a wonderful juice bar and delicious salads (although we did feel a little strange there, being the GAPS-carnivores that we are!) The best part about finding a local restaurant like this is that it can really enhance your travel experience, as you find little treasures all along your trip! Keeping cold foods cold. We have a large cooler that we can fit in the back end of our SUV (surrounded by our luggage). We usually keep it near the hatch where it can be reached conveniently. All of our cold items are placed in here, and every day or two we stop and buy another big bag of ice to keep everything cold. If the hotel where we are staying at has a fridge, we take advantage of this while we are there. Here are lists of several items that you will need to bring along with you on vacation (this is obviously just GAPS-related … although there are times when I’ve packed less clothes to bring more food! 😉 ) Your list will vary slightly depending on your tastes and where you are on the stages of the diet; however, it can be used as a reference when you are packing for your trip. Hardboiled eggs: These usually keep about a week, and I store them in the cooler. They make for a quick addition to breakfast, especially since the free continental “breakfast” at a hotel rarely has anything that is GAPS-legal. Place steak in the freezer for 2 hours (this makes it easier to slice). Remove and trim the fat off. Slice into 1/8 inch pieces. For the London broil steak, slice it with the grain; for the flank steak, slice it against the grain. Whisk all the ingredients together and combine with the steak in a shallow bowl or ziplock bag. Cover and marinate overnight or up to 24 hours, turning occasionally to coat. Remove the meat and pat dry with paper towels. Preheat the oven on the lowest setting (150-170F). Line baking sheets with unbleached parchment paper, place racks on the sheet and place meat on the racks (do not overlap the meat). Cook for 8-10 hours, turning halfway thru. Leave the door open a crack while the meat cooks. Broth: I make ours out of chicken and let it simmer down until it makes a nice gelatin. Then I keep it in our cooler in a glass Mason jar, without worrying that it will spill. If you are staying at a hotel, it is then possible to reconstitute your broth by pouring boiling hot water into a cup half full of this gelatin (you can get hot water from the breakfast area or make your own using filtered water and the in-room coffee maker). Lunchmeats: This is something that we’ll use for a quick lunch on the road or if we need to pack a lunch (like for a day we’re hiking). I use the Organic Prairie brand. You could also use Applegate organic hot dogs for quick meals (or for roasting around a campfire). Canned meats: You can also bring canned fish along with you, like sardines or tuna. Make sure you are using a reputable brand and that the can doesn’t contain BPA. Chicken pancakes: This is a quick and easy recipe that you can make ahead. I use the chicken left over from making meat stock, and then blend it together with eggs (usually about 6-7 eggs per 1 ½ to 2 cups of meat). When you have a batter-like consistency, fry it up in small pancakes. Serve drizzled with a little honey or plain. My boys love it. Fermented veggies: These usually store best in the cooler but you don’t necessarily have to pack them in there (however, for hot summer vacations, I recommend it … unless you want an exploding science experiment in your back seat!) Remember to bring your kraut that you can eat with your meals, plus a variety of other fermented veggies to keep things healthy (and interesting). Fresh fruits and veggies: You can also add frozen veggies to your cooler, such as peas (My boys love eating peas cold). We usually bring along bags of bananas, apples, carrots, or other favorite fresh fruits/veggies for snacking on the road. Plus side: they keep pretty well too. (Try to buy your bananas in different stages of ripening: some green, some slightly yellow, and some mostly ripe. This will keep them from going bad on you). Fruit “rollups” and leathers: You can make a lot of different dehydrated fruit strips that will keep well on your trip. Whole Foods also carries an organic brand of fruit strip without additives. These keep well and are nice for a snack between meals. Baked goodies with nut flour, including GAPS bread and pancakes: These are nice for breakfasts when you can’t have something warm (think muffins, pancakes, banana bread). However, the baked goods do not keep for very long (not usually more than 5 days or so when traveling), so if you are planning an extended road trip, only make enough to last for the beginning of your trip. You will need to plan to make a pit stop somewhere where you can purchase snacks and foods for the rest of your trip. Squash bars: My boys love these (and they’re stage three legal), but they don’t keep well. They are good for the first few days of your trip only. Larabars, figs, dried fruits: These are definitely full GAPS, and Larabars are not organic. If you tolerate these items, it helps with trip planning, as they keep well and/or can be purchased along the way. There are also different brands of snack bars that you can find at health food stores on your route that only contain GAPS-legal ingredients. Jello: This is made from freshly squeezed juices and gelatin (I like the Great Plains brand of grassfed beef gelatin). You can also make little gummy candies out of gelatin and juices. These all should be stored in the cooler, as they tend to get mushy and sticky otherwise. Ghee/butter or coconut oil mixed with honey: If you are early on in the GAPS diet, it is important to remember to add this to your list of things to bring to keep your blood sugars stable. 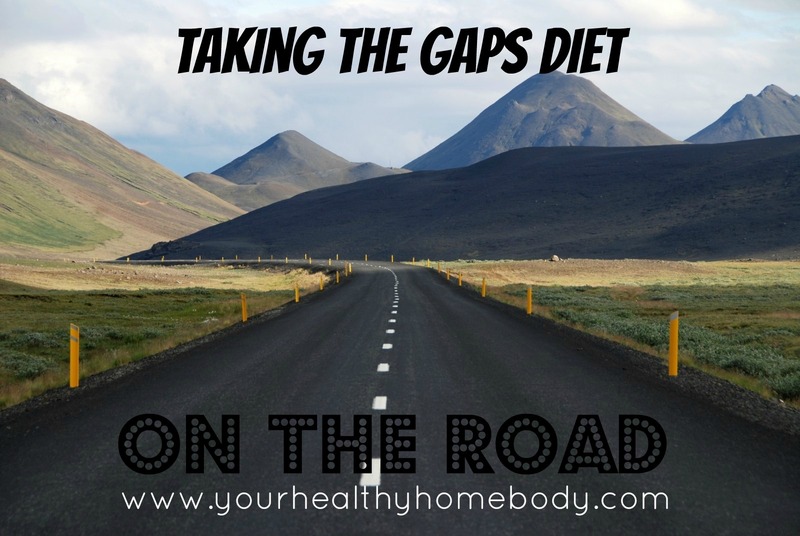 Traveling is more difficult on the Intro diet part of GAPS, but not impossible. Juicing: I will admit, it is tricky trying to juice on the road. Juice does not keep well if made ahead of time, so you either need to bring your juicer and the produce you will be juicing with you (when we went up to Michigan, I brought my small Nutri-bullet, which worked great for smoothies) or you need to find juice bars along your route and at your destination city. Requires a little planning, but not impossible! Yogurt/kefir/sour cream: Bring enough fermented dairy to last the duration of your trip; this stores well in the cooler. If I’m planning to make GAPS milkshakes regularly, I also bring along some fresh eggs and keep these in the cooler as well. Crackers and dehydrated veggie chips: Another snack that can be made up ahead of time and brought with you. There are a variety of cracker recipes out there. You can make veggie chips from a multitude of sliced veggies, like beets, zucchini or even kale. You can look into specific recipes, or you can make it as simple as slicing, salting with sea salt, and dehydrating. Yum! Nuts and nut butters: Using soaked and dehydrated nuts, you can make up some nut butter as a snack or make a trail mix using dried fruits and nuts. So I know you’re probably thinking, wow, I wonder how big that cooler of hers is! 😉 The items listed above are just suggestions. Depending on how much (or how little) you plan to bring with you, you can tailor the list to suit your needs. Probiotic – If your probiotic needs to be refrigerated, make sure this is something that you add to your cooler. However, I recommend only bringing as many capsules as you will need on your trip (and maybe just a couple extra) and storing them in a tight ziplock bag. On one very hot trip we took, our ice bag melted, causing a small lake to form in our cooler, and this lake overflowed into my new bottle of probiotics at the bottom of the cooler … causing them all to gel together and disintegrate. If your probiotic doesn’t need to be refrigerated (like Prescript Assist), that’s great! Just remember to bring it with. Cod liver oil and EFA fish oil supplements: Again, cod liver oil can be stored in the cooler, but bring a small container of it. Getting separate containers of all these things may seem like a lot of work, but in the long run it saves you space in your cooler and it saves your expensive supplements if something were to happen. Other non-perishable supplements, like iodine paint, digestive enzymes … Be sure to pack these as well, and always bring a few extra days worth, just in case. Magnesium flakes, baking soda, clay, etc. for your detox baths: I tend to (again) plan ahead and see how many nights we will be taking detox baths. Then, I pour each item into individual baggies for each night that I will be using it. Again, I may bring one or two extra in case we need an extra detox bath. Detoxing from chlorine: One splurge that I allow my boys on vacation is swimming at the hotel pool. The pool is full of chlorine, which is toxic and terrible, but again, this is one thing that I allow us. To counteract the toxic effects of the chlorine, I have used a couple of different sprays and lotions. Also, I apply DiGize on their bellies to help them to detox from the toxic effects of the chlorine. Add the Epsom salt, baking soda and boiling water into your blender, and pulse until dissolved. Add the vegetable glycerin and oil slowly while blending to emulsify. When mixed, add a little lotion or coconut butter at a time until blended smooth. Use this lotion over the body after exposure to chlorine. Taking a shower immediately after exposure and a detox bath are helpful as well. Frankincense: for oh, so many things; on vacation, I like to use it to help support healthy brain function and protect us from any toxins that we might encounter, whether in the hotel room, pool, etc. I use several different essential oils for digestive support: changes in routine and different eating habits tend to make for upset tummies on vacation. Cedarwood, lavender, and Roman chamomile in a roll-on: to help end quickly any meltdowns that may occur. Changes in routine, lack of sleep and long hours in a car can cause anyone to have a meltdown, not just your child with special needs. A roll-on for pain and sore muscles: this is another great roll-on that helps with pain from injuries, headache, etc. There’s two different blends that I use: one contains peppermint, lemon, balsam fir, copaiba, clove, wintergreen, helichrysum, vetiver, and palo santo; and the other contains wintergreen, helichrysum, clove, and peppermint. I also like to bring blends containing tea tree (melaleuca) essential oil because it’s a great purifier, wonderful for skin and wounds, and helps take care of yeast infections quickly. And guaranteed, even if you bring 50 bottles of oil with you, you will be missing the ones you left at home! Bug spray: I make a quick and easy blend of filtered water, a little sea salt and several drops of my bug spray essential oil blend in a glass spray bottle. Sunscreen: You can quickly make a homemade version of sunscreen using essential oils. You can also visit my Etsy shop for a nontoxic homemade spray-on sunscreen using essential oils. Chlorine filters for bathtub: You can bring along your own filter from home to place under the spout in the tub to help filter most of the chlorine out of the hotel water. We use the Rainshow’r Series 3000 Crystal Ball for the Bath; there are also Sprite balls that you can use. Both are easy to transport and easy to use on the road. This may seem like a lot to prepare and a lot to remember, but really, the more prepared that you are, the more you can enjoy the time you spend on your actual vacation. The first vacation we took I stressed and worried, and worry is not going to help you have a great time (and neither is it healthy). Plan BEFORE your trip so that you can travel with confidence … and best of all, have a vacation that you (and your digestive system) can enjoy!